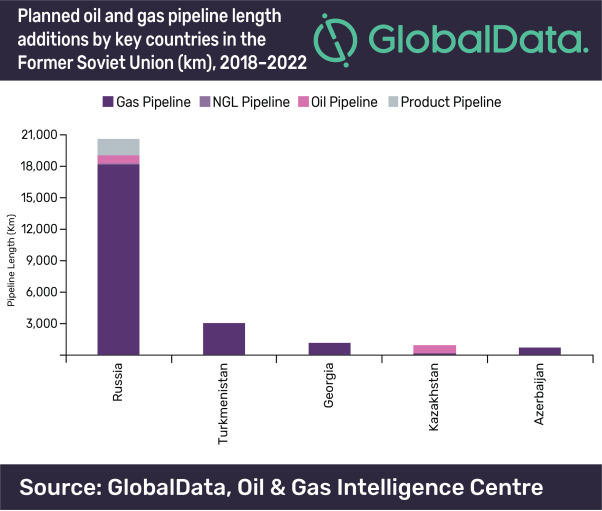 Russia is forecast to add the highest trunk pipeline length in the Former Soviet Union oil and gas pipelines industry between 2018 and 2022, contributing a total length of 20,680 km by 2022, which will account for around 75% of the region's planned and announced oil and gas pipeline length additions, according to leading data and analytics company GlobalData. The company's report: ‘Oil and Gas Pipelines Industry Outlook in Former Soviet Union to 2022' forecasts that around 27,720 kilometers (km) of planned and announced oil and gas pipeline length will be added in the Former Soviet Union by 2022, taking the region's total oil and gas pipeline length to around 419,268 km by 2022. The report also states that the three longest planned and announced oil pipelines in the region by 2022 are Eskene–Kuryk pipeline in Kazakhstan, Brody–Adamowo pipeline, and ESPO offshoot–Komsomolsk pipeline in Russia with lengths of 739 km, 396.3 km and 293 km respectively.